He is a master of everything: painting, drawing, portraiture, watercolour. Andrey Esionov holds a special place in the artistic context of Moscow. He stands apart; it seems he is a native of some other land, the very patrie imaginaire that Marcel Proust kept bringing up. In real life, everything is quite simple and mundane. A quarter of a century ago Esionov moved to Moscow from Tashkent, which in Soviet times had a powerhouse of an art school; the Tashkent Institute offered excellent and independent education, a rare occurrence in the Soviet Union. What was it, the heritage of such outstanding Russian settlers as Alexander Volkov, or the very presence in Central Asia of remarkable, cutting-edge works of Russian modern art that created this unique atmosphere? Today, some of the “graduates” of the Tashkent art school work here in Moscow; they share a certain distinctive character, conduct themselves independently and have the stubborn gift of perseverance. One could say that Andrey Esionov is like that. Moscow did not nurture him; nobody showered him with kindness or made sure he had a chance to exhibit; no one assured his position in professional associations. In 2013 he showed his work at the Academy of Arts, but, surprisingly, did not learn that much about this large, fragmented community of renowned, obscure, gifted and other kinds of artists. He knows a few names of Moscow artists and he respects and values some of them; however, his understanding of their work, their lives, their background and related legends is profoundly rudimentary. It is possible that he is not really that interested in our “local talent” and our local art scene, also known as “our local social myth”. He is prepared to carefully examine us and adopt some of our ways, because he is a good learner and knows how to absorb information; however, he does so from a certain distance. He is very much on his own. He has established himself on our Moscow soil, but seems to be also rooted in other formations of world art culture. Esionov’s case is mystifying and calls for special research. Can artists show up from nowhere, can they really exist in isolation? Usually, they hang out with their own kind (no matter how narrow their circle may be), they teach in schools and universities, they meet with journalists and come to presentations and discussions. They make friends and enemies; they compete with one another, marry within their circle and do their best to replenish the population. They are all different, but one can always distinguish those that are from Moscow. Esionov has never been one of us. It is safe to say that he has never become fully “our guy”. We do not want to make a point here, or dwell unnecessarily on this thought. As a matter of fact, any big city that serves as a major cultural centre has quite a few “lone wolves” of all kinds, as well as other odd characters who are not really tied to the genius loci. However, it is important to understand right away that Esionov holds a peculiar place in relation to the central issues of Russian history and cultural tradition. He is not a stranger to it, and he is not an outsider to us. Nevertheless, he has the ability to look at our problems from an outsider’s prospective, which does produce its own results. Over the last five years, Esionov has established himself as an artist who lives in Moscow and can paint well, both winning city scenes and portraits of its distinguished citizens. There is no record as to what kind of artist Esionov was before that. Two or three of his early works, painted when he was a student in Tashkent, are preserved at his Moscow studio. These are the fresh and robust works of a beginner; filled with sun and zest, they tell us about life deep in the heart of Asia. They were followed by close to 20 years when the young artist stopped painting altogether and engaged in entirely different activities. Those were the years when university professors became taxi drivers, liberal arts majors went into business, and artists experienced transformations that were no less extreme. Not all of those who were swept up by the winds of perestroika would later go back to what they were meant to do – and what they were trained to do. Esionov returned to painting and drawing after 20 years, so his late debut (in Moscow, in the years after 2010) was even more remarkable and unusual. Esionov is very ambitious. Achieving any single one of his goals would be enough for an outstanding life-long career in painting. He wants to use all the means that both painting and graphic arts have developed through history and that remain relevant today. In his large-size paintings Esionov seeks to define the major fundamental issues of our existence; his method is not that of “naïve illustrating” – he creates real art, with complex space, plasticity and colour scheme. Esionov paints large-scale compositions on philosophical and religious themes, such as “Genesis”, “The Last Supper”, “Renaissance”, and “Apocalypse”. Careful examination reveals numerous allusions to academic art, 19th century symbolism, and to the celebrated masterpieces of the Renaissance. Esionov’s style is confident and powerful; he works effortlessly with open brushstrokes. His experience with watercolour helps him paint with flat and transparent washes. He does not, however, shy away from rendering contours or small details when he chooses to; when it feels right, he forgoes the trivial task of separating shapes. Indeed, his style is confident and powerful. Effortlessly, as if it were child’s play, Esionov turns to the very fashionable post-modernism and creates ironic “dramatized” compositions, such as the one on the subject of the 1812 Battle of Borodino. The painting portrays perfectly recognizable historical personalities marching on an enormous chessboard as they play out one of the most fateful “contests” in the history of pre-modern Russia. What is more, Esionov’s chessboard shows a real chess position, one of the most dramatic and dangerous ones that this peaceful and magnificent game has to offer. These large-scale canvases share the same grand idée fixe: the drama of our Universe is played out by all sorts of characters and phenomena; they are born, they make their appearance, and they die; they seek the Truth and fight for their beliefs. However, on their own they mean nothing. Even the lovely Eve, who appears in Esionov’s painting “Genesis” as she wakes up to life in the beautiful land of clear waters and majestic mountains, bows to the Demiurge’s will. The hand of God is right there, and nothing will come to be without it. The Creator brings life and takes it away, too. This glorious, cold and beautiful world is created and destroyed, and there is nothing to be done about it. A student of Western thought will hear in Esionov’s philosophy echoes of the majestic and indifferent Universe according to Pascal – a mathematician, thinker and theologian. Or could it be that our artist has dipped into the Eastern fatalism of the Old Testament, the Quran, and the Upanishads? Esionov’s large-size multi-figure compositions speak of the unrelenting forces of the Universe. The four horsemen of the Apocalypse come upon the viewer as if riding the wave of an awesome and perfect tsunami, which resembles a giant aquamarine. On both sides on the canvas, the Demiurge’s hands are chopping through terra firma with giant scissors, as if cutting short the scroll of life. This life is to end. Apocalypse, or the “Book of Revelation”, is awe-inspiring and uplifting, for it tells us that our earthly abode is doomed and will be destroyed when its time comes, but there will be another life, another earth and another sky. There is not much space for such hope and such bright promise in Esionov’s philosophy. The Book of Genesis describes Creation as beautiful as Adam and Eve; however, things would go off track. In “The Last Supper” Jesus Christ brings all the energy of Salvation into a focus to fix it. He is not planning to re-create the world, but He seeks to enlighten it, to saturate it with light; as if willed by the Saviour, a new star shines its light in front of Him. He was anxious to save humanity steeped in wickedness; Christians believe that He was able to do so. However, there have always been plenty of those who were skeptical on the subject, from medieval heretics to the enlightened Masons. “The Last Supper” may be the happiest and most hopeful of Esionov’s large-scale multi-figure compositions. In contrast, his historical paintings are positively merciless. No one is in control of the situation in “The Battle of Borodino”, neither the short and energetic Napoleon nor his adversary, the gangling dandy Emperor Alexander. They move on the chessboard exactly where the ruthless formula tells them to go. The progress of this chess match is predetermined. Western civilization, with its Enlightenment, Revolution and Constitution would take its own course. Russia would move in her own direction. She is not choosing it for herself: the laws of worldwide historical logic would determine both Russia’s audacity and her benevolent despotism, the only way to rein in her runaway will. The time will come when life would unravel in the whirlpool of yet another Russian uprising. The time will come when the only way out would be to submit to the supreme authority while complaining – as Ossip Mandelstam put it – about the disgusting power of “a barber's hairy hands”. Such is Russia’s fate. Esionov’s historical paintings are dedicated to the fate of the Russian world. It is neither the rulers, heroes, military commanders nor genii that determine our path; they just follow certain signs that come from elsewhere – it would be good if it were from above. Thus, we have reason to believe that in his historical paintings (there are only a few of them) Esionov has devised his own historical philosophy: an outsider, he stepped in and said things that were especially important to us, things that our contemporary art did not get around to, or simply was not able to voice. The artist’s biography goes hand in hand with certain mythological and fairy tale themes. A highly-trained professional artist, he did not touch brushes or paper for 20 years. He did not paint or draw. According to myth, such lengthy abstinence gives special abilities and special powers, and ensures the strength of an epic hero and the insight of a sage. Having emerged from his ascetic feat, Esionov tackled concepts that were always of great importance for Russia’s major painters, writers and musicians. Russia’s fate (what else?) was the question Andrey Esionov had in mind. The glorious destiny, with sky bright with diamond-like stars, is also the ugly, merciless fate that occasionally gives our nation superhuman energies. Sometimes it draws one to dementia, delirium and mental and spiritual decay. As we know from our literature, Andrey Bolkonsky’s battlefield at Borodino and the little town called Glupov (the name means “stupid” in Russian) were located quite close to each other in the cultural geography of our imagination. Let me remind forgetful readers that Esionov is not an “ideological artist”, but a masterful painter privy to a complicated historical philosophy. Consequently, his painting is much more than a cheap and clichéd lament of the follies and absurdities of the notorious Ukrainian revolutions; it is a painting about Russia’s fate. 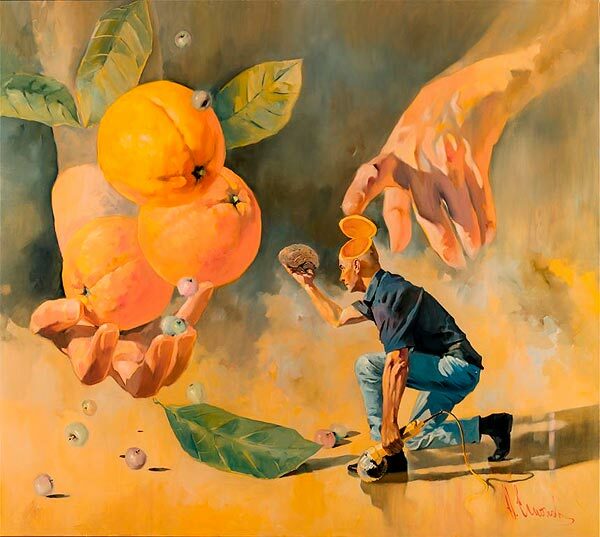 The three fantastical oranges (it is impossible to stop staring at them) do not just stand for the “orange” psychoses of our brother-Slavs, but represent our own fantasies as well. Here we have our common post-Soviet delirium, complete with tantalizing pleasures and fruits that we are sure to get, we just have to reach for them. Oh, and there is one more thing we have to do: empty our minds and open them up for those who want to put their words in them. There are plenty of visionaries, and they are all waiting to enlighten us and make us happy. The love for three oranges will start making its rounds, and things will be evil and wild both in Kiev and Moscow. Esionov looks at the issue of Russian history and fate from a harsh, universal and precise point of view, without declarations of nouveau-patriotism, thickheaded ideology, or the nervous shudder of cosmopolitan liberals. One could say that our artist painted a work of Pushkin-like clarity and laconic contoured shapes. Therein is the riddle: how did he do it? How did he just show up on our Moscow art scene and, without warning, pick up the language of philosophical art, giving us a slightly detached look at our history while having no illusions as to its interior, hidden mechanisms? This leads us to the “Kant question”: what could have make Esionov an artist? One day, some art experts will attempt to answer it. To come up with a definitive answer, we will have to wait a little longer, until Esionov has a chance to develop his interest in painting philosophical-religious and historical-philosophical compositions. So far, there are not too many; surely, new ones will come. Also, alongside large-size multi-figure canvases Esionov has always painted other kinds of works; among others, a considerable series of portraits. The artist has been studying and portraying those whom we continue calling the “intelligentsia of creative professions” due to old and erroneous habit. Nobody has painted these kinds of portraits since maybe the 17th century. Following some old masters, Esionov transforms the portrait into a staged scene with allegorical attributes. The people he paints are artists, writers and thinkers. They represent the successful artistic elite of modern-day Russia; they have achieved recognition and made a significant contribution to arts, public life and science. They are the crème de la crème, the brains and conscience of this country in a challenging time that lacks intelligence and conscience. They are actors who play on this universal stage, surrounded with amusing attributes and captured in characteristic – sometimes almost grotesque – poses; they may very well be inhabiting their own fantasies and daydreams. Esionov puts Mikhail Gorbachev, looking elderly, heavy and sad, in a frozen landscape of ice crystals and fantastical “icebergs”. Like Andersen’s character from “The Snow Queen”, the retired Communist party leader and the first and only president of the USSR seems to be either putting together or taking apart an inscription on the frozen shell that is now covering the planet. The new ice age is here. In Andersen’s story, the young Kai was trying to put together the word “eternity”. He could not do it because the evil magic of the Frozen Land robbed people of their ability to understand and use human words. The words that appear in front of Gorbachev are “who is who”; go ahead and try to understand it if you can. One thing is clear: we are looking at a thinking person who tried to change the world and give people freedom; instead, what somehow came about was an icy breath and hopeless silence, and it is now impossible to understand who means what in this world of super-low temperatures. The sturdy male figure bonds with the ice, and we are chilled by this severe and inwardly tragic scene. Every individual in Esionov’s portraits comes with some unrelated stories and digressions, sometimes even anecdotes and pictorial paradoxes. It is easy to see and understand their attributes and motives. Thus, the portrait of the remarkable film director Vladimir Naumov gives off a vibe not unlike an old friend’s “tongue-in-cheek” affection. What we see here is not a cold fantasy of a frozen kingdom, like the one in Gorbachev’s world, but an amusing and playful, almost childlike whimsical image. Spare and grey-haired, Naumov seems to have sat down for just a moment, his animated face and nimble body filled with impatience, as if he is waiting to get up and go somewhere, start some exciting theatre or cinema project. In case we had any doubt as to this charming and vibrant man’s character, Esionov gives him a companion – a tired old Pegasus that would have looked like Don Quixote’s Rocinante but for a pair of straggling wings on his back. This poetic horse is perfect for the eccentric Naumov. Allegorical attributes in Esionov’s portraits are always playful and border on a carnival culture. He paints people whom he is close to, people whom he finds interesting, and those that are somehow especially important to him. There is a portrait of another artist in Esionov’s gallery that works as Naumov’s “opposite”; it is the portrait of Zurab Tsereteli. Another vibrant, creative personality, mischievous and open, but with a different temperament. The substantial, powerful figure and the smiling triumphant face of this unstoppable optimist and international cultural figure are painted next to another mythological beast; this time though, it is no classical Pegasus but a spectacular heavyweight of a bull with enormous horns and wings on his back. Should this hefty source of inspiration jump up and dart off, a deafening rumble and great confusion will follow. In a word, behold Tsereteli, as he is. A person’s character, his temperament, occupation and unique talents are all expressed in various attributes, gestures and motifs; sometimes they are quite conventional and predictable, but occasionally they become stunningly pointed and paradoxical. Alexey Leonov, the cosmonaut who is himself a painter, gets to hold a couple of stars (or comets) in his powerful hands, as befits his military rank. He is a star in his own right, and not only because he is a general who is famous for his travels in space. He is also an artist, and as the Russian saying goes, he is so gifted he can “grab stars from the sky”; he is the kind of creative and extraordinary person that Esionov the portraitist notices and seeks out. The portrait of the chess player Anatoly Karpov is set up in a fairly predictable way. The figure of Rodin’s “Thinker” and the hourglass are a clear reference to the nature, mission and occupation of this unassuming but remarkably gifted chess grandmaster. Likewise, it is not hard to guess why the fairy-tale golden fish, which can magically grant any wish, shows up in the portrait of the fashion designer and style guru Vyacheslav Zaitsev. The fairy tale story of a miraculous reversal of fortune and the mythology of glamour – what could be more fitting for the portrait of this extravagant cultural figure? Tahir Salahov, who rejuvenated Soviet art half a century ago and is now guiding our confused artistic community, turns into a contemplative sage. We see him on the shore of a mysterious ocean (could it be the universal cosmic ocean? ), greeted by unbelievably large seagulls, those free birds of the vast seas. Extraordinary individuals who are deeply rooted in the culture of Moscow, those faithful exponents of its genius loci appear before us in Esionov’s portraits. We see Eldar Ryazanov, the ironic and refined master of Soviet and Russian cinematography, and the writer Vladimir Voinovich – sharp, satirical, paradoxical and independent. There are many others. Esionov’s portraits mark an important conceptual stratum of his art; they offer an answer to the painful questions of Russia’s destiny articulated in his large-scale philosophical works. The universe is beautiful and insensitive, and history is merciless and beyond our control. The only way out is to trust the hopeful light that illuminates “The Last Supper”. Moreover, we should be proud of our worthy contemporaries in Esionov’s portraits – the tragic Gorbachev, the mischievous Naumov, the contemplative and wise Salahov, the indefatigable Tsereteli, the innocent dreamer Leonov, as well as many other representatives of our diverse species. A stern and insightful thinker, a serene and detached witness of human conduct, a master of concise, classical painting technique – this is just one side of Esionov. Another is that of an artist who bears witness to human goodness and creates portraits of his finest compatriots. However, this is not all. There is a third dimension to the artist as well: the lyrical chronicler of everyday life and keen observer of street scenes. Esionov is a master of watercolour; with equal ease, playfully he paints both the streets of Moscow, where he has lived for more than 20 years, and Rome, Jerusalem, Madrid and Paris, where he has traveled in the last few years. He paints these watercolour chronicles with much joy and in large numbers; more than that, he does it in the most demanding of techniques, that of painting in situ, with minimal finishing touches later. Esionov has painted dozens of watercolour “travel journals” of extraordinary quality. He has captured light and shadows on the walls of eternal Rome and easy-going Paris; he peered into the crowds in Jerusalem and studied the city’s distinctive types; he caught moments in the life of different cities and different cultures. He does all that carefully, vigilantly, and off-hand, demonstrating a brilliant grasp of architectural styles, the specifics of climate and human behaviour. With a few splashes of colour, Esionov paints a clochard in the streets of Paris who clearly acts like an outgoing, talkative Parisian, while a dejected homeless man in Moscow appears to be an altogether different species, as saintly and feeble-minded as he is unkempt. Esionov has a phenomenal visual memory. His trained eye captures people’s gestures and individual ways: different types, ages and temperaments. The wet pavement in Madrid is different from roads in Berlin after rain. The humid warmth of blessed Cyprus is unlike the dry heat of Palestine and Samaria. All of the above is evident in Esionov’s large-size watercolours. Esionov’s large-size oils are rational, intellectual and logical, notwithstanding his passionate, persistent and strong personality. In his watercolour “chronicles”, he reveals himself as an insatiable pantheist and a pagan worshipper of living matter. He lets himself go, as if he just heard the blessed sound of the “Nunc dimittis”; he sets philosophy and history aside. The interplay of light and shadows is intoxicating – on the facades of Baroque cathedrals, on the sand by the sea, on the waves of the Mediterranean Sea, on car windows… People’s everyday life and places where they live en masse – those are the joyful and delightful subjects of Esionov’s watercolours. Apparently, it is possible to deal intelligently with high matters and, at the same time, cherish and eagerly take in everyday life, unexpected and messy. An artist can do that. Inside the lone wolf and wanderer there survives a naïve worshipper of sun, rain, green trees and pebbles, a young girl walking by, and a retiree sitting on a bench in the park, and Moscow’s shabby walls and golden domes. It is impossible to take one’s eyes off it all. These watercolours are indeed wonderful. Could it be that the artist is trying to tell us that we can be at home in our capital and in the Mediterranean; among lighthearted passers-by in a southern city as well as in hard-working, rainy Germany? Could it be that on the horizon of his art a new understanding of Russia’s destiny is taking shape? What if Russia’s destiny is not as harsh as one felt so many times in the past, and feels nowadays?